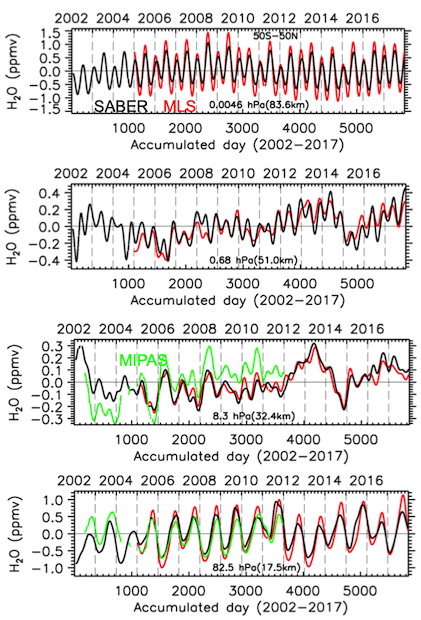 Time series of H2O anomalies at selected pressure levels for SABER (black), MLS (red) and MIPAS (green). The 50S - 50N global average is calculated on a daily basis and then a 60-day smoothing is applied to each data set. H2O cross sections from 2009 and 2011 for SABER, MLS, and SOFIE. H2O Tropical tropopause tape recorder phenomenon for SABER and MLS. January 2018 - SABER global infrared emission power from 5.3 µm NO and 15 µm CO2 through the end of 2017. These are slowly decreasing from the maximums reached in December 2014 as the current solar cycle approaches it's minimum. 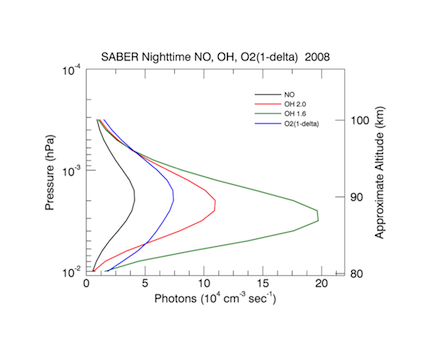 December 2017 - A new version of night time SABER derived atomic oxygen is available - see note on 'Data Services' page. The new data is derived from an updated kinetic model of OH(v) originally described by Mlynczak et al. [2013a]. Rate coefficients in the model have been adjusted to account for the recently discovered large quenching rates of highly vibrationally excited OH by atomic oxygen [Sharma et al., 2015]. 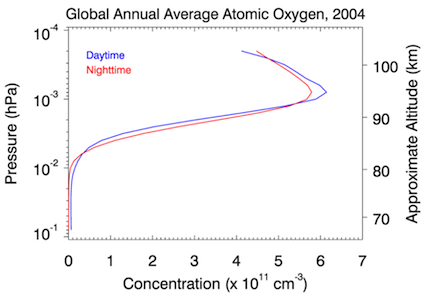 The new atomic oxygen profiles are approximately 25% smaller (global average) than reported in Mlynczak et al. 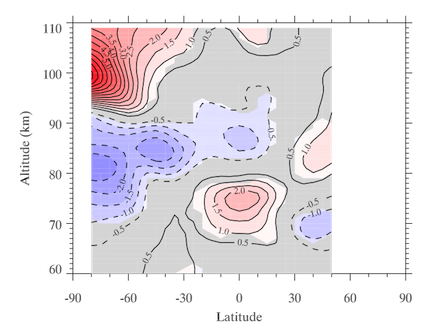 [2013a], but retain all of the spatial and temporal variability described by Smith et al. . The new atomic oxygen profiles also yield a much more physically realistic global annual mean energy budget than the original version and the new profile values lie between the radiatively allowed global annual maximum and minimum atomic oxygen profiles described by Mlynczak et al. [2013b, c]. Mlynczak, M. G., et al., (2013c), Radiative constraints on the minimum atomic oxygen concentration in the mesopause region, Geophys Res. Lett., 40, 3777–3780, doi:10.1002/grl.50725. Mlynczak, M. G., et al., (2013b), Radiative and energetic constraints on the global annual mean atomic oxygen concentration in the mesopause region, J. Geophys. Res., DOI: 10.1002/jgrd.50400. Mlynczak, M. G. et al., (2013a), Atomic oxygen in the mesosphere and lower thermosphere derived from SABER: Algorithm theoretical basis and measurement uncertainty, J. Geophys. Res., DOI: 10.1002/jgrd.50401. Sharma, R. D., P. P. Wintersteiner, and K. S. Kalogerakis (2015), A new mechanism for OH vibrational relaxation leading to enhanced CO2 emissions in the nocturnal mesosphere. Geophys. Res. Lett., 42, 4639–4647. doi: 10.1002/2015GL063724. 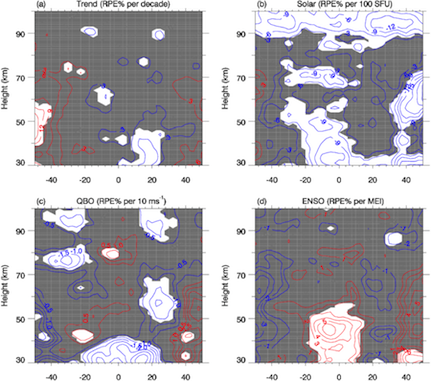 Smith, A., K., D. R. Marsh, M. G. Mlynczak, and J. C. Mast, Temporal variations of atomic oxygen in the upper mesosphere from SABER, J. Geophys. Res., 115, D18309, doi:10.1029/2009JD013434, 2010. March 2017 - SABER global infrared emission power from 5.3 µm NO and 15 µm CO2. These are slowly decreasing from the maximums reached in December 2014 as the current solar cycle approaches it’s minimum. The high correlation with the Ap index over the past month is indicative of the direct impact of geomagnetic activity. January 2017 - This figure shows the latitude-height sections of the annual mean long-term change of SABER gravity wave potential energy (a) and the responses of RPE to (b) solar flux, (c) QBO and (d) ENSO. The shaded regions indicate the results are not significant at 90% confidence level. The red and blue contour lines denote positive and negative values, respectively. The intervals of each contour line are, respectively, 3% RPE per decade in (a), 3% RPE per 100 SFU in (b), 0.5% RPE per 10 ms-1 in (c) and 1% per MEI in (d). The long-term change of gravity waves likely induced by the anthropogenic change in the troposphere and stratosphere could influence the state of the upper atmosphere. Liu, X., J. Yue, J. Xu, R. Garcia, J. Russell III, M. Mlynczak, D. Wu, T. Nakamura, Long- term changes of global gravity waves derived from SABER observations, submitted to J. Geophys. Res. Atmos. December 2016 - SABER monthly global mean CO2 profiles and a one-dimensional transport model are used to estimate the global mean eddy diffusion coefficient (Kzz). The Kzz is specified as a lower boundary condition into the NCAR Thermosphere Ionosphere Electrodynamics General Circulation Model (TIEGCM). The global mean Kzz shows an annual and semi-annual oscillation with maxima during solstice and a primary maximum in boreal summer, as shown as the yellow curve in the figure. This new Kzz result helps us to understand the origin of seasonal variations of the Earth’s thermosphere and ionosphere densities. Salinas, C. C. J. H., L. C. Chang, M.-C. Liang, J. Yue, J. M. Russell III, and M. G. Mlynczak (2016), Impacts of SABER CO2-based eddy diffusion coefficients in the lower thermosphere on the ionosphere/thermosphere, J. Geophys. Res. Space Physics, 121, doi:10.1002/2016JA023161. 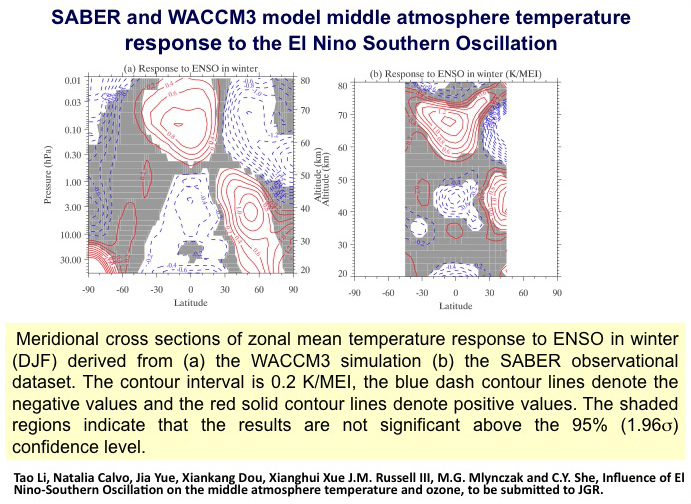 August 2016 - SABER revealed a significant upper mesosphere cooling and a lower thermosphere warming during warm ENSO events (El Nino) in December in the Southern Hemisphere. An opposite pattern is observed in the tropical mesopause region. Li et al. suggests that enhanced planetary wave (PW) dissipation in the NH high latitude stratosphere during El Niño strengthens the Brewer-Dobson circulation and cools the equatorial stratosphere. This increases the magnitude of the SH stratosphere meridional temperature gradient, and thus cause the anomalous stratospheric easterly zonal wind and early breakdown of SH stratospheric polar vortex. The resulting perturbation to gravity wave filtering causes anomalous SH mesospheric eastward gravity wave forcing, polar upwelling and cooling. Li, T., N. Calvo, J. Yue, J. M. Russell III, A. K. Smith, M. G. Mlynczak, A. Chandran, X. Dou, and A. Z. Liu (2016), Southern hemisphere summer mesopause responses to El Nino-Southern Oscillation, J. Climate, 29, 6319-6328, DOI:10.1175/JCLI-D-15-01816.1. August 2016 - The empirically derived infrared energy budget of the thermosphere from 1947 to 2016. 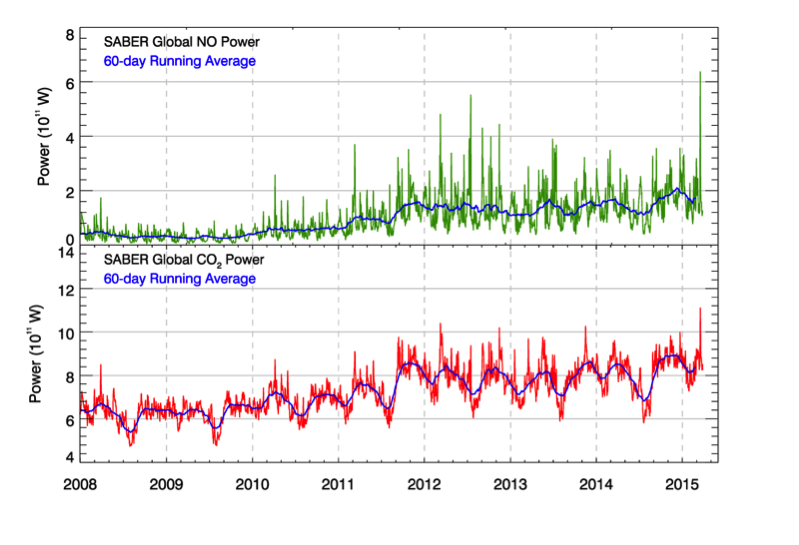 The total radiated power from NO (green), CO2 (red), and their sum (blue) are shown. The solar cycle number is shown in the middle of the plot. Also shown are the occurrence of sunspot maximum (plus) and the infrared cooling maximum (cross). Mlynczak, Martin G., Linda A. Hunt, James M. Russell, B. Thomas Marshall, Christopher J. Mertens, and R. Earl Thompson, The global infrared energy budget of the thermosphere from 1947 to 2016 and implications for solar variability, Geophysical Research Letters, 2016GL070965, doi:10.1002/2016GL070965, 2016. April 2015 - SABER observes strongest geomagnetic storm in over 10 years. The strongest geomagnetic storm of the current solar cycle occurred March 17-18 when a fast-moving Coronal Mass Ejection reached Earth’s magnetic field. The energy radiated by the storm, as measured by the SABER instrument, totaled 41.7 billion kilowatt hours, enough to power every home in New York City for more than 3 years. 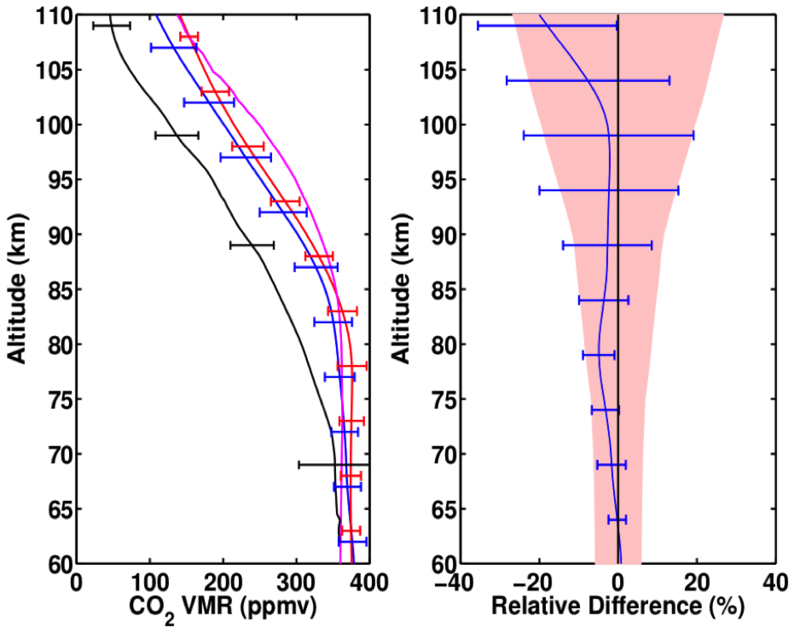 March 2015 - Left panel in the following figure shows comparison of mean CO2 VMR profiles between SABER (blue line) and ACE-FTS (red line) assembled from 9 years of coincident data. 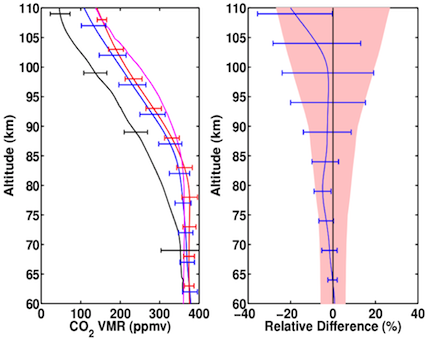 Mean CO2 VMR profile from CRISTA-1 (black line) and rocket measurements (magenta line) are shown for comparison. The right panel shows the mean relative difference between coincident SABER and ACE-FTS CO2 as the blue curve and the error bars indicate the standard deviation of the difference. The combined uncertainty of SABER and ACE is indicated in shaded area. 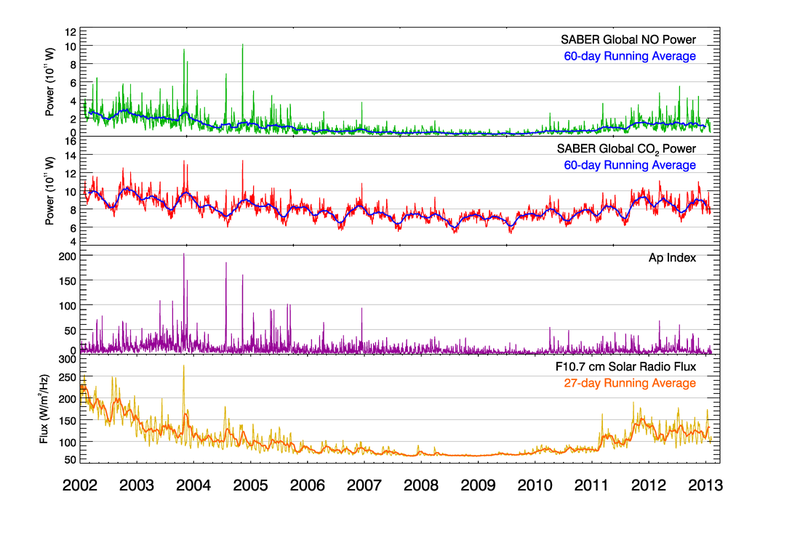 The following figure shows CO2 VMR measured at Mauna Loa during the SABER mission and the corresponding 60 day average SABER VMR at 3 altitudes. 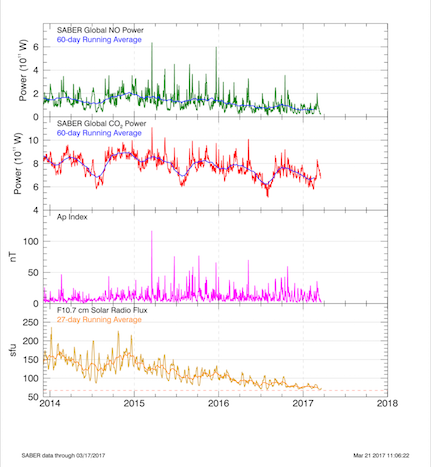 Rezac, L, Y. Jian, J. Yue, J. M. Russell III, A. Kutepov, R. Garcia, K. Walker, and P. Bernath, Global distribution of CO2 volume mixing ratio in the mesosphere and lower thermosphere from SABER, Submitted to J. Geophys. Res., February, 2015. 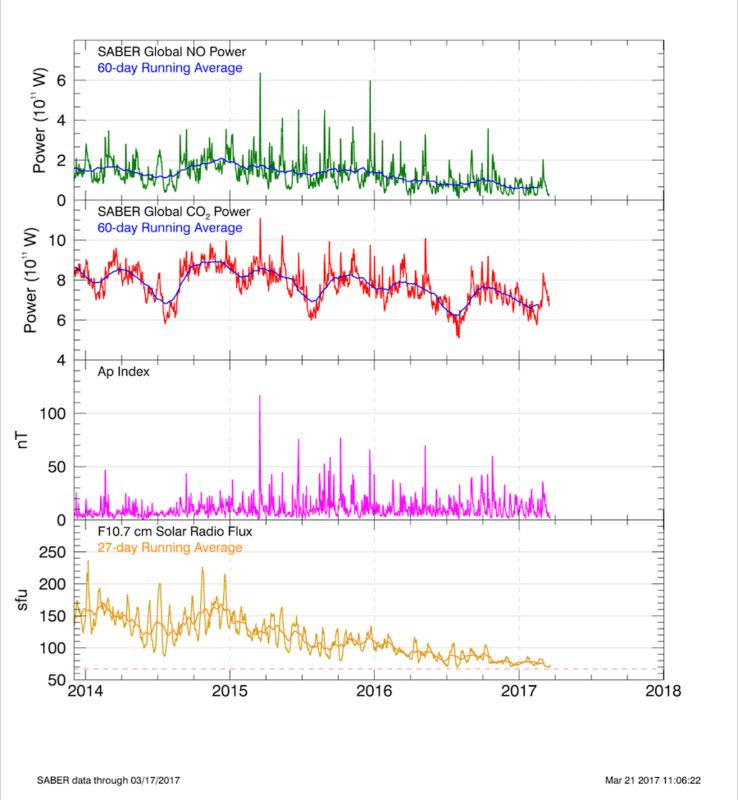 Yue, Jia, James Russell III, Yongxiao Jian, Ladislav Rezac, Rolando Garcia, Manuel Lopez-Puertas, and Martin G. Mlynczak, Increasing carbon dioxide concentration in the upper atmosphere observed by SABER, Completed manuscript to be submitted to Geophys. Res. Lett, April, 2015. February 2015 - Observation of maximum IR emission for Solar Cycle 24. 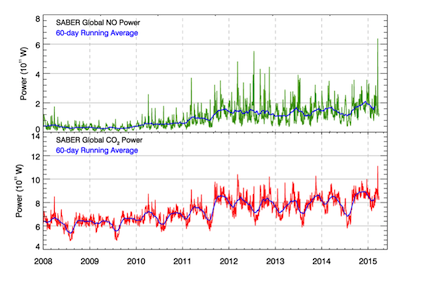 The maximum infrared emission from both NO and CO2 in cooling the thermosphere occurred late in 2014/early 2015. This is very late in the current solar cycle 24, and is approximately 10 months past the maximum in sunspot number. The maximum in infrared radiative cooling by NO and CO2 is concurrent with maxima in the F10.7 and Ap geomagnetic index. The results imply that, from the atmosphere’s perspective, “solar maximum” is dependent on both solar ultraviolet radiation and geomagnetic processes, and that sunspot number may not be a sufficient proxy for the occurrence of solar maxima relative to processes in Earth’s atmosphere. January 2015 - Linear regression fit to SABER NO power time series. Multiple linear regression fit of the SABER NO power time series (60-day running average) using the F10.7, Ap, and Dst indices. The multiple correlation coefficient for the fit is 0.985. This figure shows that the energy output by NO can accurately be fit with a simple linear regression involving indices that describe the energy input. Reconstruction of the NO power time series back to 1947 based on the coefficients derived from the fit shown in the previous figure. Extant databases of the solar and geomagnetic indices are used to generate the fit. This nearly 70-year time series is an integral constraint on a key term in the global energy balance of the thermosphere. From the 70-year reconstruction in the previous figure we show the fraction of the NO power that is due to energy deposited by solar ultraviolet radiation (via the F10.7 index) and by geomagnetic processes. These processes alternate in importance over the course of the 11-year solar cycle although solar UV almost always provides more than half of the energy that is ultimately radiated by NO. December 2014 - SABER has discovered a new airglow layer in the mesopause region at 5.3 µm. 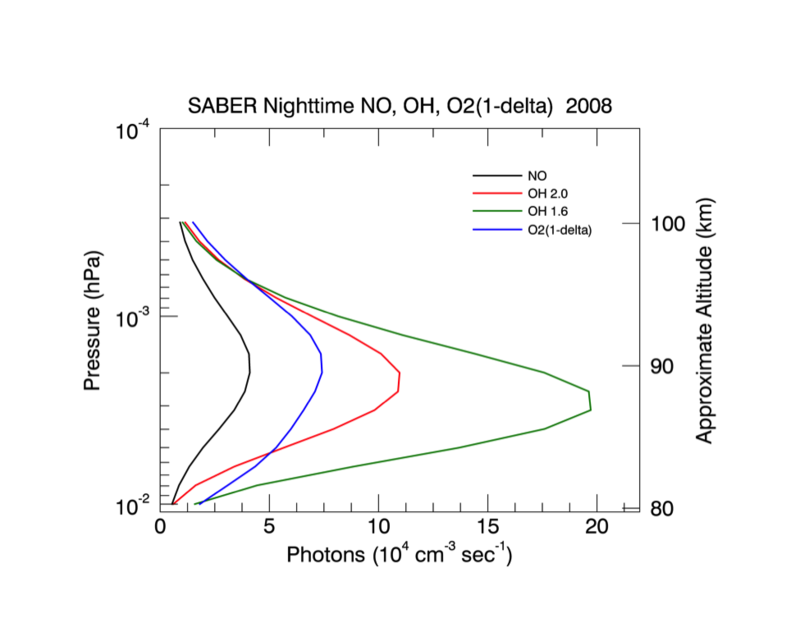 Shown below are the classic OH and O2(1-delta) airglow layers measured by SABER. The new NO layer is shown in the black curve. Preliminary analysis suggests the origin of the airglow layer is a mixture of emission from combination bands of ozone and the fundamental band of nitric oxide. 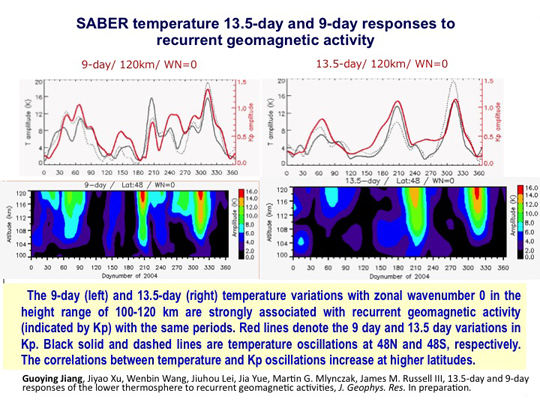 April 2014 - SABER makes the first observations of the 11-year solar cycle response of the main thermospheric radiative cooling mechanisms. The temperature of Earth’s thermosphere (100 to ~600 km) is determined by the balance between energy gained from the Sun (ultraviolet radiation and solar wind particles) and energy lost through infrared emission. Carbon dioxide (CO2) and nitric oxide (NO) molecules emit most of the infrared radiation that cools the thermosphere. The 11-year variability of the Sun, particularly at ultraviolet wavelengths, causes large (several hundred degree) variations in the thermospheric temperature. 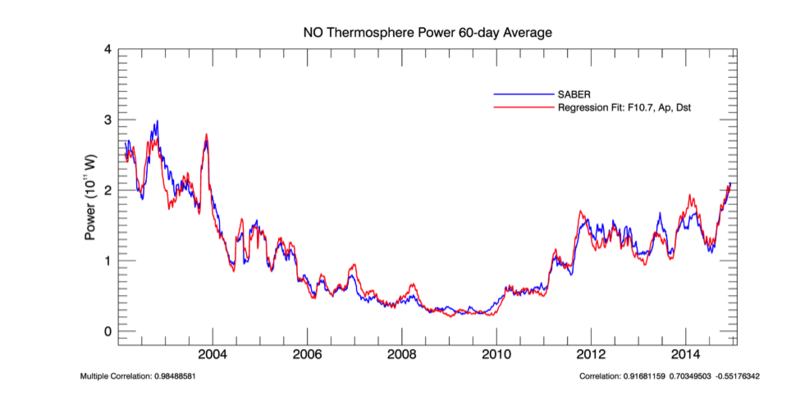 Since 2002 SABER has been measuring the rates at which infrared radiation from both CO2 and NO cool the thermosphere. SABER data are providing the first-ever observations of the key processes that help regulate thermospheric temperature and density. 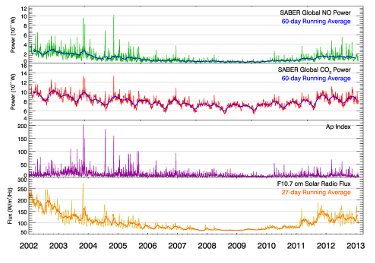 SABER has quantified the variability of infrared cooling on daily to decadal timescales. These data clearly show the marked difference in the maximum of solar cycle 23 (in 2002-2003) and the maximum of solar cycle 24 (in 2013-2014). 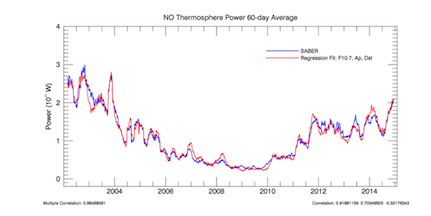 SABER infrared cooling data are crucial for understanding the basic natural variability of the thermosphere. In particular, it is anticipated that as CO2 increases in the atmosphere due to anthropogenic effects, there will be a long-term cooling trend in the thermosphere. 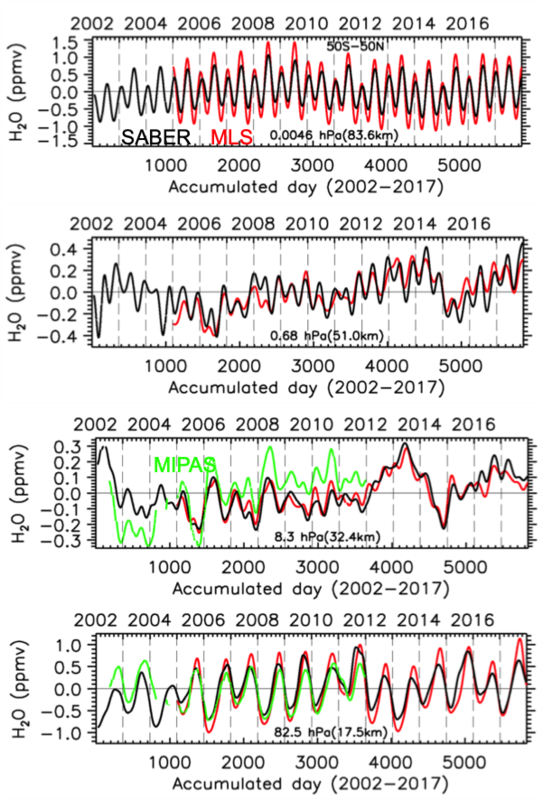 SABER data provide the first long-term observations for testing the radiative physics of upper atmosphere models to verify these predictions. This research is directly aligned with the 2013 NAS Heliophysics Decadal Survey Report Key Science Goal 2: “Determine the dynamics and coupling of Earth’s magnetosphere, ionosphere, and atmosphere and their response to solar and terrestrial inputs.” In addition to the basic scientific knowledge, SABER data have practical applications to space flight operations. Specifically, as the thermosphere cools, density decreases at the altitudes where satellites fly. The decreasing density has the unwanted effect of increasing the lifetime of orbital debris, which poses prolonged hazards to satellites and to the International Space Station as well. SABER data can also be used to directly test models of orbital drag and orbital lifetime. The figures below show deseasonalized (over period of 60 days) time series. The left hand figure shows CO2 thermospheric infrared power (top frame) and SEE 60-day radiative anomalies (relative to the SEE long-term mean, bottom frame). 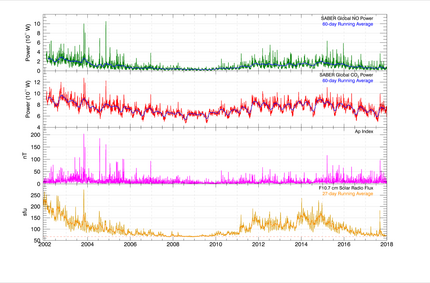 The progression of the solar cycle is clearly seen in the CO2 power from January 2002 to January 2014. The right hand figure shows NO thermospheric infrared power (top frame) and anomalies in the Kp geomagnetic index (relative to the Kp long-term mean, bottom frame). Correlations with geomagnetic activity appear stronger during the 2002-2003 maximum than during the current weaker maximum period. Mlynczak, M. G., L. A. Hunt, C. J. Mertens, B. Thomas Marshall, J. M. Russell III, T. Woods, R. Earl Thompson, and L. L. Gordley (2014), Influence of solar variability on the infrared radiative cooling of the thermosphere from 2002 to 2014, Geophys. Res. Lett., 41, doi:10.1002/2014GL059556. 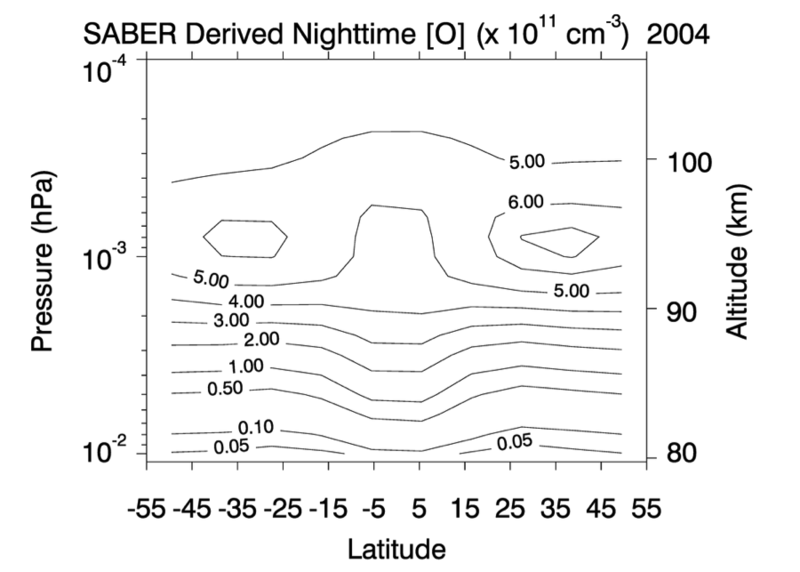 March 2014 - SABER and MLS observations, combined with modeling, show long-term increases in mid-northern latitude Noctilucent Cloud occurrence frequencies for the 2002 to 2011 period. Motivated by numerous ground-based Noctilucent Cloud (NLC) sightings at latitudes as low as ~40°N in recent years, a study was conducted to determine if there have been any systematic long-term increases in NLC occurrence frequencies in the mid-northern latitudes. This question was addressed through investigating both measured and modeled NLC occurrence frequencies. 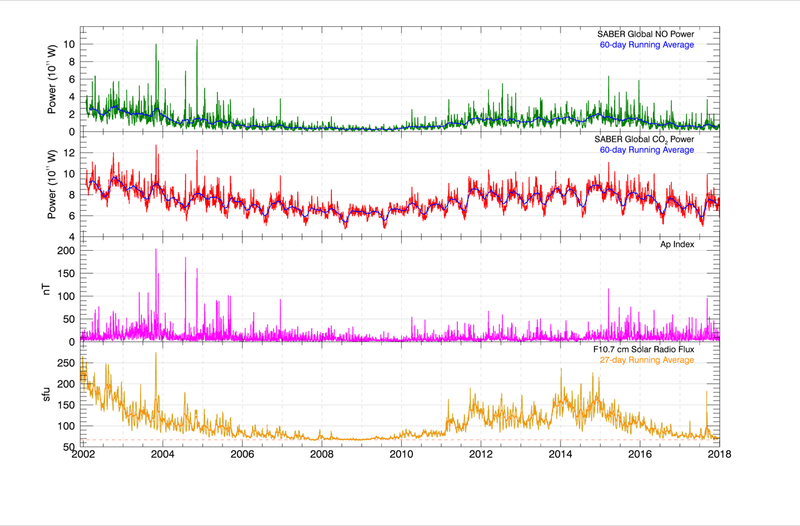 Temperature measured by the SABER instrument on the TIMED satellite over the 2002–2011 time period and water vapor measured by the MLS instrument on the Aura satellite for the 2005–2011 period, were used to simulate mid-latitude NLCs. NLCs measured by the OSIRIS instrument on the Odin satellite and the SHIMMER instrument on the STPSat-1 satellite were used to extensively validate the model-generated NLC results. The model (Hervig et al., 2009) gave remarkable agreement with the NLC measurements made by the satellite instruments and provided confidence in its use to examine NLC variability. The results show a statistically significant increase in the NLC occurrence frequency in the latitude range 40°N–55°N for the 10 year period between 2002 and 2011. This is the first confirmation that NLCs have been increasing in the mid-northern latitudes. The increase appears to be driven by corresponding mesopause region temperature decreases over the same time period. During this time, solar activity decreased from a maximum to a quiet period, which might have been partially responsible for the temperature decrease over this time period. Further research to understand these changes and their consistency is ongoing. 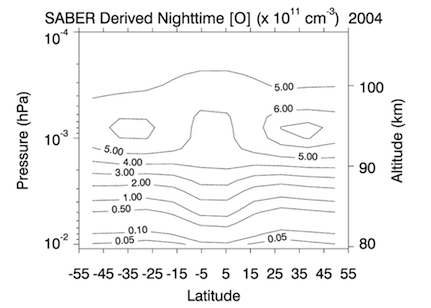 Russell, J. M., III, P. Rong, M. E. Hervig, D. E. Siskind, M. H. Stevens, S. M. Bailey, and J. Gumbel (2014), Analysis of northern midlatitude noctilucent cloud occurrences using satellite data and modeling, J. Geophys. Res. Atmos., 119, 3238–3250, doi:10.1002/2013JD021017. 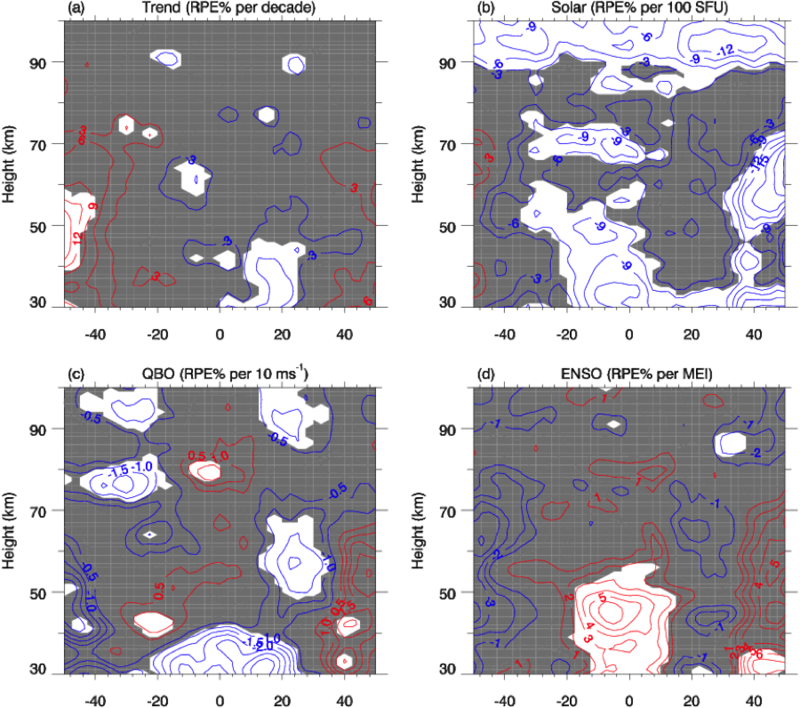 Hervig, M. E., M. H. Stevens, L. L. Gordley, L. E. Deaver, J. M. Russell, and S. Bailey (2009), Relationships between PMCs, temperature and water vapor from SOFIE observations, J. Geophys. Res., 114, D20203, doi:10.1029/2009JD012302. July 2013 - First observations of atomic species in the MLT by SABER provide unique dataset for testing climate models and assessing basic understanding of the atmosphere on the edge of space. Earth’s mesospause region between 80 and 100 km altitude is unique because it is the lowest part of the atmosphere in which atoms are a permanent and significant part of the atmosphere’s composition. Specifically, atomic oxygen [O] and atomic hydrogen [H] are present in significant amounts, and in the case of [O], comprise up to 1% of the composition. These two species are critically important to the mesopause region because they govern the flow of energy from the Sun to the atmosphere. Ironically, both [O] and [H] are extremely difficult to observe from orbiting satellites because they do not readily emit energy that can be detected by conventional satellite instruments. The [O] and [H] abundances have been derived from measurements of ozone (O3) and hydroxyl (OH) which are directly and chemically related to the [O] and [H ]abundances, respectively. The data have revealed several crucial findings that advance our understanding of the mesopause region. First, the absolute abundances of [O] and [H ] are now established in a data record approaching 13 years in length starting in 2002, allowing for rigorous testing of upper atmosphere climate models. Second, the effect of the 11-year solar cycle is clearly evident in both [O] and [H], but with one surprise: the [H] concentration is strongly negatively correlated with solar activity while the [O] concentration is positively correlated. This result is surprising because the processes that generate [H] are directly dependent on solar ultraviolet radiation, which is positively correlated with the 11-year solar cycle. The negative correlation results from stronger solar cycle dependence of the chemistry of [H]. Further, because of the difficult of measuring [O] and [H] directly, validation of the SABER results is also critical. SABER energetics data (infrared cooling and solar heating rates) can be used to bracket the energetically allowed range of [O] atom abundance in the mesopause region. This approach provides an independent and self-consistent validation of the SABER [O] data, which are found to be near the energetically allowed limits. In summary, SABER atomic species constitute a unique dataset that is being used to assess fundamental understanding of a key region of Earth’s atmosphere. 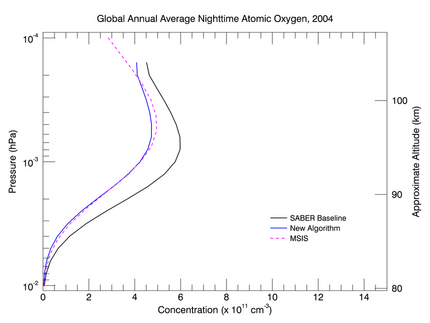 SABER annual zonal average night atomic oxygen concentration for 2004. 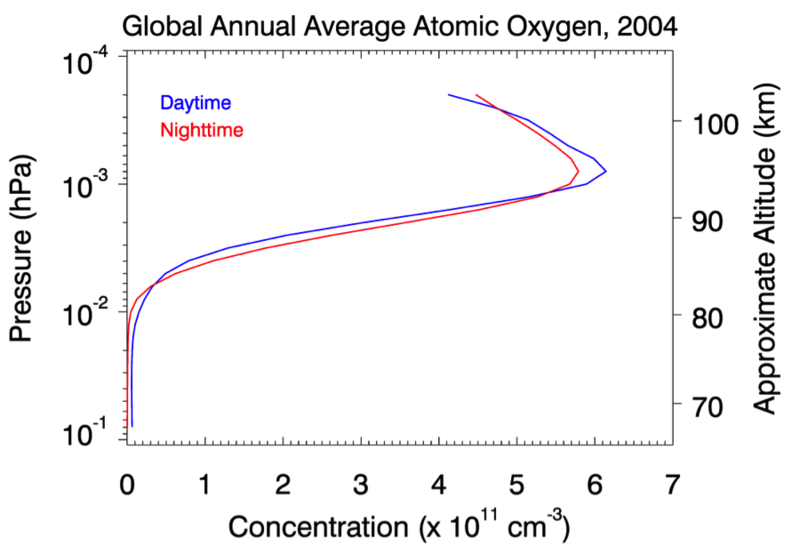 SABER day and night global annual average atomic oxygen concentrations for 2004. Global annual mean atomic oxygen for 2004. 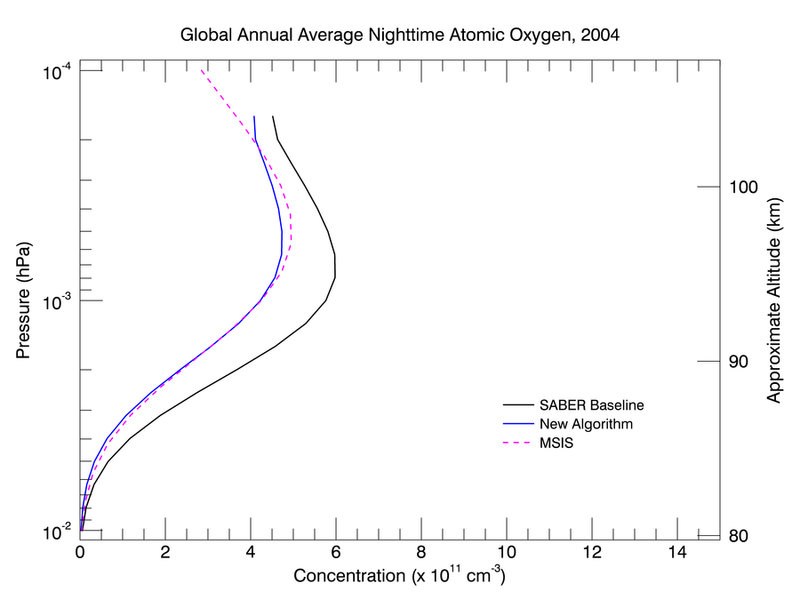 The black curve labeled “SABER” is the global average atomic oxygen derived from SABER ozone and OH emission measurements. 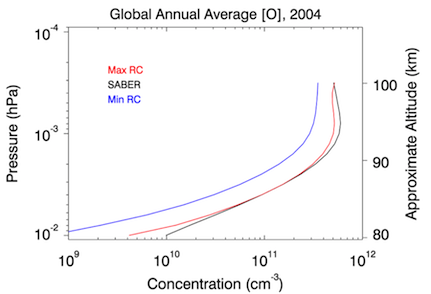 The red curve labeled “ Max RC” is the radiatively constrained global annual mean atomic oxygen derived from SABER solar heating and radiative cooling rates. 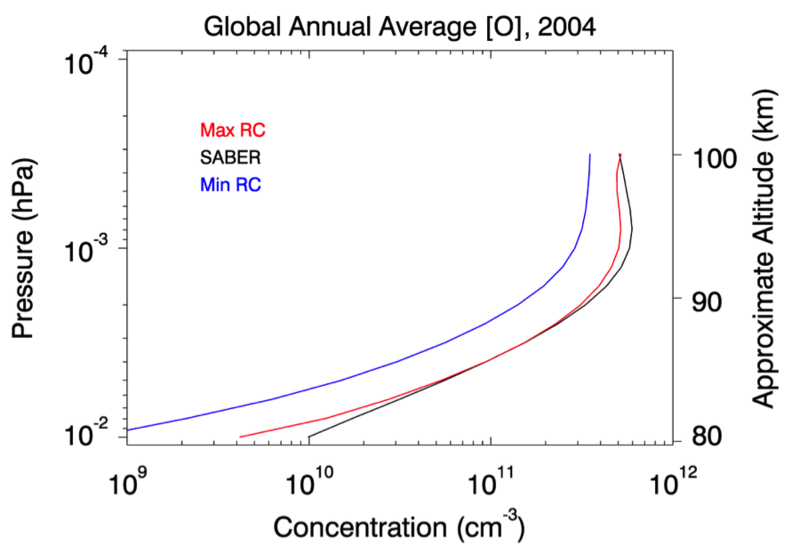 The blue curve labeled “Min RC” is the annual global mean minimum radiatively constrained atomic oxygen derived from SABER observations. Mlynczak, M. G., et al. (2013), Atomic oxygen in the mesosphere and lower thermosphere derived from SABER: Algorithm theoretical basis and measurement uncertainty, J. Geophys. Res. Atmos., 118, doi:10.1002/jgrd.50401. Mlynczak, M. G., et al. (2013), Radiative and energetic constraints on the global annual mean atomic oxygen concentration in the mesopause region, J. Geophys. Res. Atmos., 118, doi:10.1002/jgrd.50400. Smith, A. K., et al. 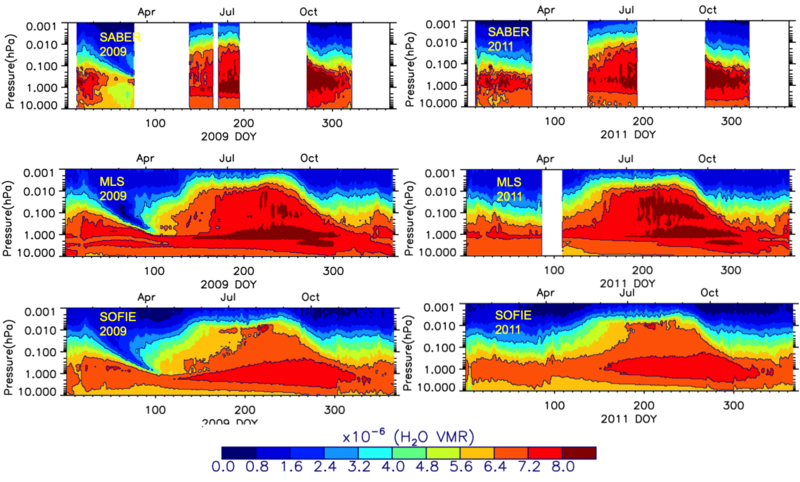 (2013), Satellite observations of ozone in the upper mesosphere, J. Geophys. Res, 118, 5803–5821, doi:10.1002/jgrd.50445. 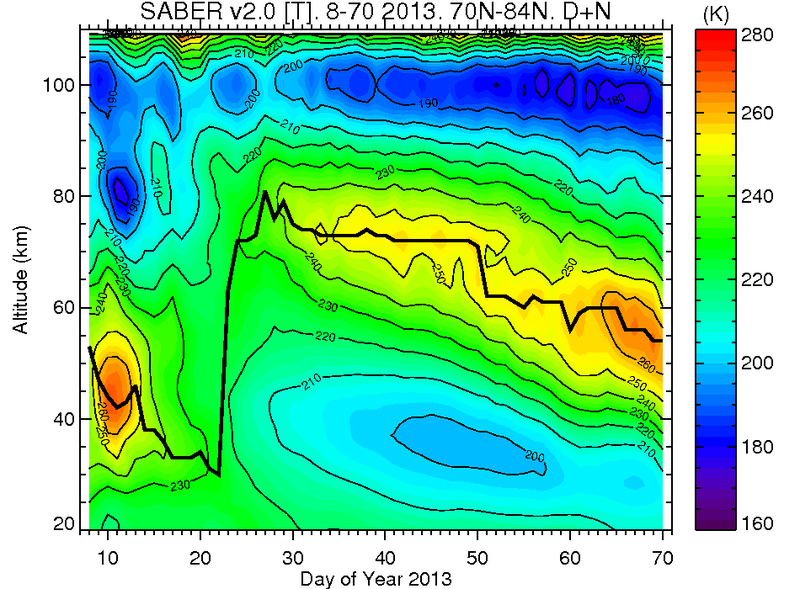 March 2013 - SABER zonal mean temperature at high northern latitudes for the period 8 January-11 March, 2013, showing a stratwarm in early January followed by the formation of an elevated stratopause near 80 km on 23 January and its subsequent descent in the ensuing weeks. The thick black line shows approximate altitude of the stratopause. 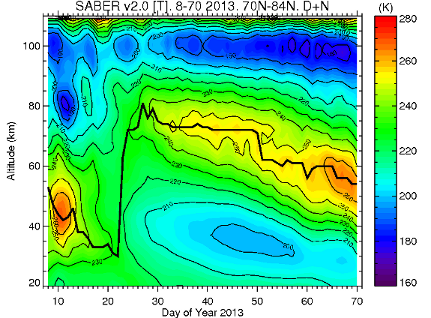 February 2013 - SABER observations of a northern hemisphere elevated stratopause on February 9, 2013. Modeling studies by Chandran et al. (2011 and 2103) show that this upper atmosphere condition is driven by changes in the penetration of non-orographic gravity waves into the mesosphere that cause the elevated stratopause to last for extended periods of time of more than a month [Chandran, A., et al., "A case study of an elevated stratopause generated in the Whole Atmosphere Community Climate Model", Geophys. Res. Lett., 38, L08804, doi:10.1029/2010GL046566, 2011 and "A climatology of elevated stratopause events in the Whole Atmosphere Community Climate Model", J. Geophys. Res., 118, 1-13, doi:10.1002/jgrd.50123, 2013]. February 2013 - SABER version 1.07 temperature 13.5 day and 9 day responses to recurrent geomagnetic activity. 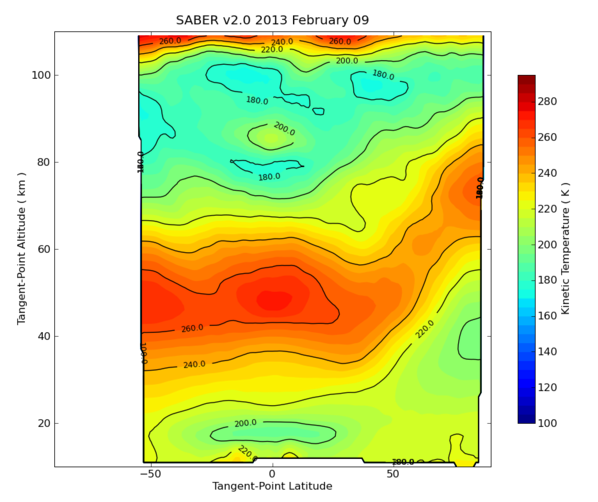 February 2013 - SABER version 1.07 temperature response to the El Niño Southern Oscillation. November 2012 - We are currently processing V1.07 and V2.0 data. V2.0 data will be available on the FTP as it processed & validated. The custom data tool will continue to use V1.07 data until a large portion of V2.0 data is available.